News > 2016 > Two BBA students win the Grand Prize in the MOUVEMENT social innovations competition! Two BBA students win the Grand Prize in the MOUVEMENT social innovations competition! 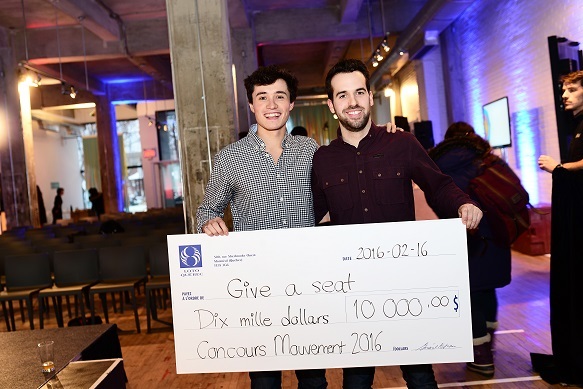 BBA students Guillaume Campeau and Théo Corboliou have won the Grand Prize in the MOUVEMENT social innovations competition held by Novae and Loto-Québec, for Give-a-seat, a platform that lets ticket holders donate unused tickets to sports and cultural events so that the proceeds can go to charity. The project was chosen from 10 finalists, and the pair will receive $10,000 to make it a reality. The Give-a-seat platform lets holders of sports and cultural series tickets donate their unused tickets, so as to raise funds for charities in their name. The two students, who have already received significant support from HEC Montréal through the Rémi Marcoux Entrepreneurial Track and the Entrepreneurship specialization in the BBA program, hope to launch their project in Canada within the next ten months, before expanding their platform to other countries.